According to a new market report published by Transparency Market Research titled “Mass Spectrometer Market–Global Industry Analysis, Size, Share, Growth, Trends, and Forecast, 2018–2026,” the global mass spectrometer market is projected to expand at a CAGR of 7.7% during the forecast period 2018-2026. According to the report, the global market will continue to be influenced by a range of macroeconomic and industry-specific factors. Growth in pharmaceutical and life science markets, rise in demand for clinical analysis, increase in mergers and acquisitions, and increase in food and beverage testing has influenced the penetration and growth of the mass spectrometer market globally. MALDI-TOF is expected to continue to be the leading segment globally during the forecast period due to growing use of MALDI-TOF spectrometers for various applications in clinical diagnostics, environmental and taxonomical research, and food processing and quality control. MALDI-TOF segment is projected to expand at a considerable CAGR of 8.0% over the forecast period 2018 to 2026.The application of mass spectrometry in biological science has progressed over the last decade. With the help of FIB system cells, biomaterials and their interfaces can be analyzed, imaged, or prepared for various techniques such as fault-tolerant operation, ensuring high reliability for closed-loop control in harsh industrial environments. Liquid chromatography-MS segment is projected to expand at the highest CAGR over the forecast period due to the growing adoption of high performance liquid chromatography in order to separate, identify, and quantify each component in a mixture during the production process of pharmaceutical and biological products. North America accounted for highest revenue share in 2017 due to concentration of leading manufacturers, high usage of mass spectrometry in the pharmaceutical sector, and growing funding to favor the mass spectrometry market. In North America, market players are continuously taking efforts to introduce advanced mass spectrometer products. In June 2016, Bruker launched the highest performance MALDI-TOF/TOF mass spectrometer rapifleX, which is by far the most advanced TOF/TOF system. Furthermore, growing laboratory automation is helping the North America market to generate significant revenue. The market in the U.S. held the highest share in 2017 in North America and is estimated to expand at a considerable CAGR during the forecast period. The market in North America is expected to expand at a significant CAGR of 8.3% during the forecast period. In a number of European countries, high penetration of mass spectrometers in industrial and non-industrial research sectors and technological advancements are fueling the growth of the mass spectrometer market. The market in Europe is likely to witness significant CAGR growth over the forecast period. The U.K. contributed highest share to the Europe mass spectrometer market in 2017. Growing food safety concerns and increased investments for pharmaceuticals has escalated the growth of the mass spectrometer market in the U.K.
Demand for mass spectrometers in APAC is likely to remain concentrated in China and Japan due to the high petrol and natural gas production and growing biopharmaceuticals and biotechnology research & development. The market in Japan is estimated to expand at a significant CAGR during the forecast period due to the growth in pharmaceutical industry and growing adoption of advanced technologies. In Middle East &Africa (MEA), market players are increasing their investments to expand their physical presence. GCC countries are expected to expand at a significant CAGR during the forecast period due to the development of biotechnology industry in the region. In South America, Brazil is expected to hold a significant portion of revenue for the market throughout the forecast period. The profiling of key players in the global mass spectrometer market includes company overview, major business strategies adopted, SWOT analysis, and market revenues for years 2015 to 2017. Key players profiled in the global mass spectrometer market includes Bio-Rad Laboratories, Inc., Agilent Technologies, Waters Corporation, Bruker Corporation, Thermo Fisher Scientific Inc., Shimadzu Corporation, PerkinElmer Inc., Charles River Laboratories International, Inc., bioMérieux SA, and AB Sciex (Danaher Corporation). Players are introducing technologically advanced mass spectrometers and establishing partnerships with other players to meet the continuously growing demand for accurate and real time measurements. The Mass Spectrometer Market – Global Industry Analysis, Size, Share, Growth, Trends, and Forecast, 2018 – 2026, report provides analysis of the mass spectrometer market for the period 2016–2026, wherein 2018 to 2026 is the forecast period and 2017 is considered as the base year. Data for 2016 has been included as historical information. 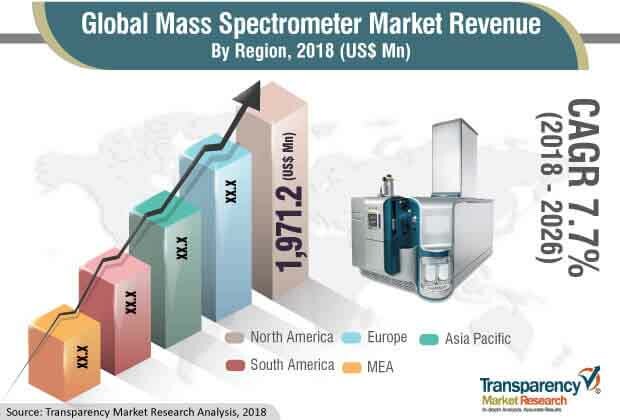 The report covers all the trends and technologies playing a major role in the growth of the mass spectrometer market over the forecast period. It highlights the drivers, restraints, and opportunities expected to influence the market growth during this period. The study provides a holistic perspective on the market’s growth in terms of revenue (in US$ Mn) across different geographical regions, namely North America, Europe, Asia Pacific, Middle East & Africa, and South America. The report highlights the key trends affecting the market on a global scale. Furthermore, region wise prominent countries/regions covered in the report include the U.S, Canada, Germany, France, U.K., India, China, Japan, GCC, South Africa, and Brazil. The report analyzes and forecasts the market for mass spectrometers at the global and regional level. The report comprises a detailed value chain analysis which provides a comprehensive view of the global mass spectrometer market. Porter’s Five Forces model has also been included to help understand the competitive landscape in the market. The study encompasses market attractiveness analysis, wherein end-users are benchmarked based on their market size, growth rate, and general attractiveness. The report segments the market on the basis of product type, application, and region. The product type segment includes gas chromatography-MS, liquid chromatography-MS, MALDI-TOF, ICP-MS (inductively coupled plasma-mass spectrometry), and Others. In terms of application, the market is segmented into pharmaceuticals, biotechnology, industrial chemistry, environmental testing, food and beverages testing, and others. Bio-Rad Laboratories, Inc., Agilent Technologies, Waters Corporation, Bruker Corporation, Thermo Fisher Scientific Inc., Shimadzu Corporation, PerkinElmer Inc., Charles River Laboratories International, Inc., bioMérieux SA, and AB Sciex (Danaher Corporation) are some of the major players operating in the mass spectrometer market profiled in this study. Details such as financials, SWOT analysis, business strategies, recent developments, and other such strategic information pertaining to these players have been duly provided as part of company profiling.